Russian mystic artist predicted and changed the future with his paintings. Among the paintings that could turn out to be prophetic, “Three Joys” occupies a special bright place. The artist offers to share the joy. This bright feeling is caused by the family of the villager in the center of the picture, to which the guslar, having arrived at the courtyard, announces three joys. The settlement is surrounded by revered in Russia Saints – Nicholas the Wonderworker, patron of agriculture and herds, Saint Egory – a shepherd and protector of horses, Elijah the Prophet – the master of rain and harvest. The fabulous image of the family, nature, wonderful forces helping the peasant in hard work, sends the viewer to the Russian folklore sources and traditions. Tells about the national spirit and character of the inhabitant of the Russian land. In the guise of St. Egoria there are also fabulous features – a pearl head. Nicholas the Wonderworker – the main defender of unhappiness, the eldest among the saints, is opposed to the terrible Ilya the Prophet and is illuminated with a nimbus, as in popular beliefs. Through these images, the artist directs a person to an impassive attitude to work, deprivation, and to divine knowledge on earth. The composition and content of the canvas also causes a wonderful feeling and refers to the folklore of the people. The villager’s hut is not a simple peasant, but a beautiful tower with a carved staircase and a fabulous birdhouse. The dwelling against the backdrop of the Russian landscape behind it seems high and large, and the meadows, fields and hills are endless and fertile. Reception of the front and rear perspectives from different points of view was used in Russian icon painting. Like the structure of the picture, creating an epic mood, summarizing the pictorial presentation. 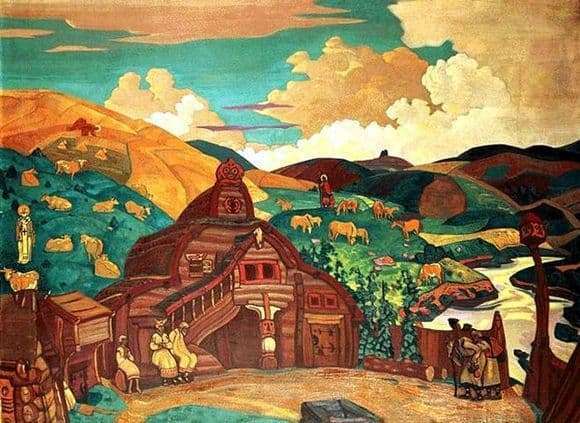 Roerich often takes these techniques as the basis for his works, expressing, thus, the main characteristics – the power of the Russian people and the people’s soul. The meaningful load of the “Three Joys” canvases lies in the faith and the inseparable connection of the Russian person, whoever he may be, with the Higher Powers, who will always come to the rescue in work and everyday life. He himself knows about his wealth and happiness, rejoices in the presence of the Holy Satisfiers.